When Jeremy Monroe was 6 years old, his family vacationed at a lake house in Minnesota. One summer afternoon, Monroe remembers carrying his fishing pole down to the pier. The water, he says, was clear as glass, and he could see schools of sunfish and bluegills darting among the sunbeams. "That was my first glimpse of the life just beneath the water's surface," says Monroe, now 42. That experience, he says, inspired his lifelong passion for aquatic life. 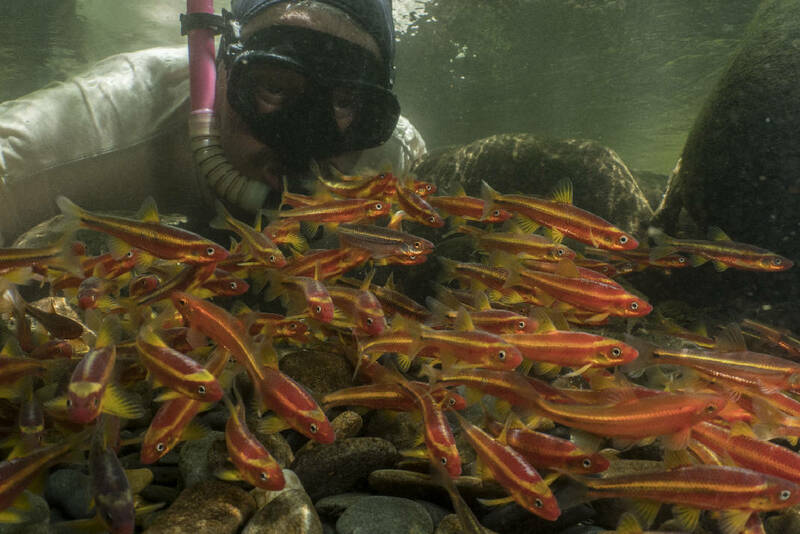 In 2003, after graduating from Colorado State University with a master's degree in aquatic ecology, Monroe founded Freshwaters Illustrated, a nonprofit organization dedicated to promoting aquatic awareness through photography, videography and film-making. In 2011, Monroe and his crew began filming "Hidden Rivers," which explores the rich biodiversity within Southeastern waterways. Over the past eight years, the Freshwaters Illustrated team has traveled to the region at least least twice per year, with each filming expedition lasting 2-8 weeks. The film, which showcases the rarely seen behavior of aquatic life, is finally complete. On Thursday, April 4 at 7 p.m., "Hidden Rivers" will premiere at the Tennessee Aquarium IMAX theater, with a special introduction by Monroe and Aquarium Vice President of Conservation, Science and Education Dr. Anna George, with whom Monroe networked over the years to learn about the local species. Recently, we had a chance to chat with Monroe about his upcoming film, his life's work and his future projects. » As soon as I found out you could study and manage fisheries, I knew that's what I wanted to do. So in college I studied fish biology, and through that I discovered I was generally interested in aquatic life. Fish opened the door to the broader world of all that's in a river or lake, so I became more interested in aquatic ecosystems. » When I was in college, I was studying these [aquatic] insects that not too many people knew about. I think a lot of biologists feel this angst: You've been let in on something and so few of your friends and neighbors know about it. I think that was the motivation when it came to [promoting] freshwater ecosystems. We all impact these ecosystems, and we all benefit from them. But, wow, we just haven't had a big awareness building movement. >> Around that same time, I was doing a lot of snorkeling. I had been having a tough time trying to describe what I was seeing [underwater], so I started tinkering with cameras. I had a transformational experience with that. Those images did such a better job telling people about freshwater ecosystems. That led to me founding [Freshwaters Illustrated]. » Even back in 2003, as soon a we founded [FI], we knew that the Southeast was a place we wanted to work. We started reaching out to biologists in the region. I remember having a phone conservation back in 2006 with Anna George [now] at the Tennessee Aquarium Conservation Institute. What are the issues there? What are the stories? Then we started doing exploratory trips to become more familiar with the landscape. » Underwater filming is a big challenge. We oftentimes were going to smaller streams, closer to the mountains, which are relatively clearer [waters]. But as you well know, compared to a lot of other regions, rainfall in the Southeast can be great. A rainstorm could wash out and muddy up a river for 2-3 days. But we did learn, if wanted consistent filming opportunities, we went to public lands, because they were less susceptible to erosion issues. » One of the most amazing things I witnessed was this really cool nest-building minnow called a river chub. They build these big gravel nests that look like mounds. Sometimes you can see them in swimming holes in the summer. But you'd probably miss them if you didn't know what you were looking for. The fish is no bigger than your hand, and the males pick up stones one by one to build a big mound of gravel to spawn and lay eggs [in]. » When [the river chub] builds it, he attracts females, but he also attracts other fish that want to use it for spawning, too. It was so neat to watch this diligent, single fish build this mound while all these other fish species gather around and start putting on their breeding colors. Everybody's getting fired up, and it's a party that can last for 6-8 days. » One of the most captivating things we captured was [footage] of the hellbender. A lot of people have heard about them, but few people have seen them. There is is a lot of folklore around these salamander — the biggest in North America. One senior cinematographer, David [Herasimtschuk], spent dozens and dozens of hours underwater with these hellbenders, capturing behaviors not many people have seen. » I like to ask people, "What's the name of a creek or water body that you live near? Now, where does that water come from? Where does it go? Who's upstream of you? Who's downstream?" They seem like simple questions, but they make you think. Sometimes we forget the connectivity of water. We are more connected to our neighbors than we think.